I have had this recipe in my database since I transferred all of my recipes there from a pair of 3-ring binders a number of years ago. It came from a now dormant Yahoo group called the gourmet garden of spicy vegetarian eatin’. 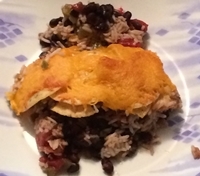 The recipe calls for mixing cooked rice and salsa with cans of diced tomatoes, black beans, diced green chilis along with sour cream, green onions, and Monterey Jack cheese. 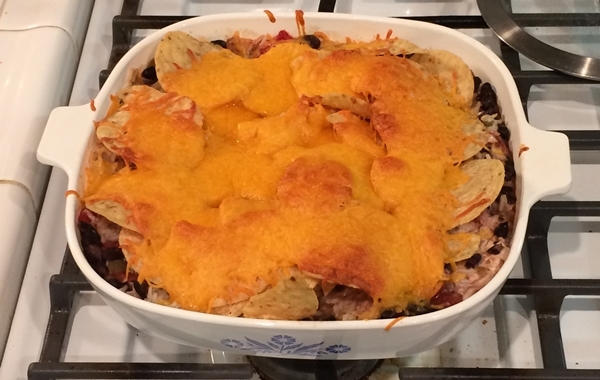 It is then transferred to a baking dish, topped with tortillas and crushed corn chips, and baked at 350 for 25 minutes. I pretty much followed this formula, though I omitted the green onions. I used whole corn chips rather than crushed, which turned out to be a good move. It all turned out better than I anticipated. Terry certainly enjoyed it and there was plenty for leftovers.